Many fixed blade enthusiasts will be familiar with the work of Martin Swinkels and I fully admit that I sought to emulate his sheath designs when I set off on this project. Further credit is due to Ian Atkinson of Leodis Leather from youtube. 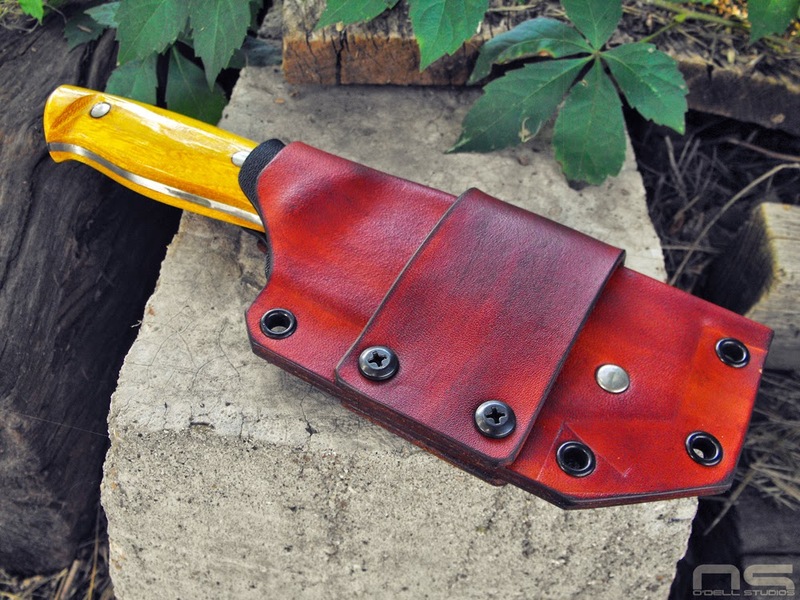 He has two specific videos; Making a Bushcraft Sheath and Making a Leather/Kydex Sheath which give you step-by-step, complete, no questions left unanswered instructions for building a sheath and ending up with a high quality product. If you want to learn to make sheaths (or anything leather) Ian's youtube channel is a one stop shop. I've made a number of leather products in the past and made enough mistakes that I felt pretty confident about this project, but good guidance never hurts. 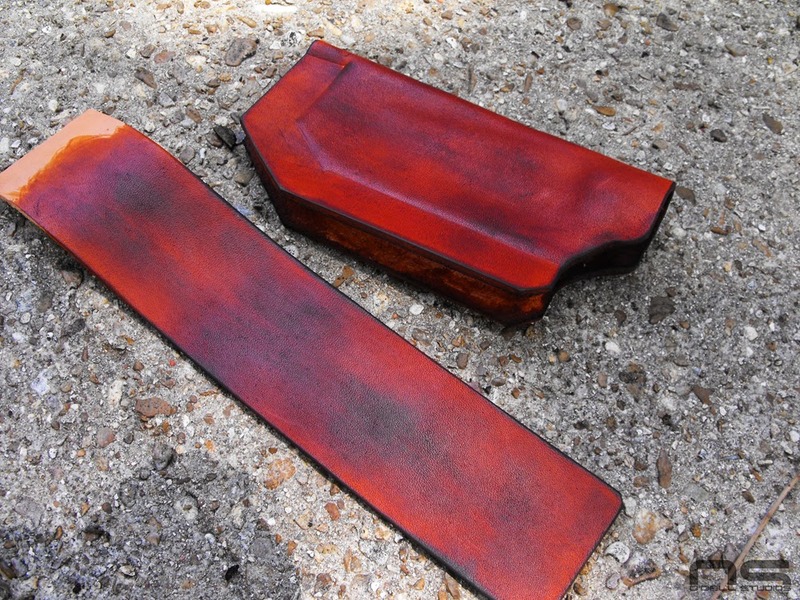 The biggest issue with my sheath is that I was buying bellies for leather and they really aren't very good. Belly leather is inexpensive and useful for a few things, but if you want something nice, it would pay to just get some good leather. With that said, leather just isn't really my thing. There are a number of products you really should have on hand to make a quality product that will last, and the leather itself is expensive. Often you have to buy more than you want or need, so it's not exactly a project one might take on with the goal of saving some money on a single item. 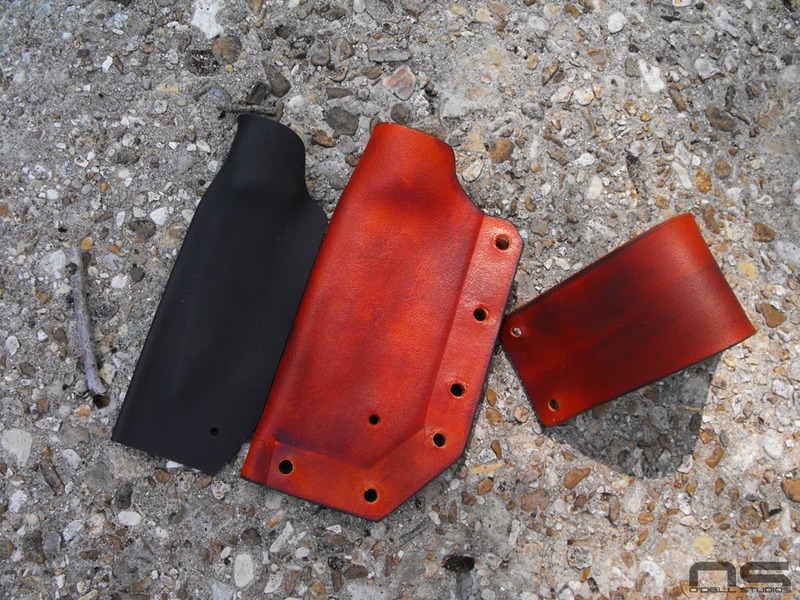 If you wanted to build yourself a holster/mag carrier/belt package then it is probably worth looking into, but like all projects or hobbies, it's the enjoyment of creating your own item that really matters. 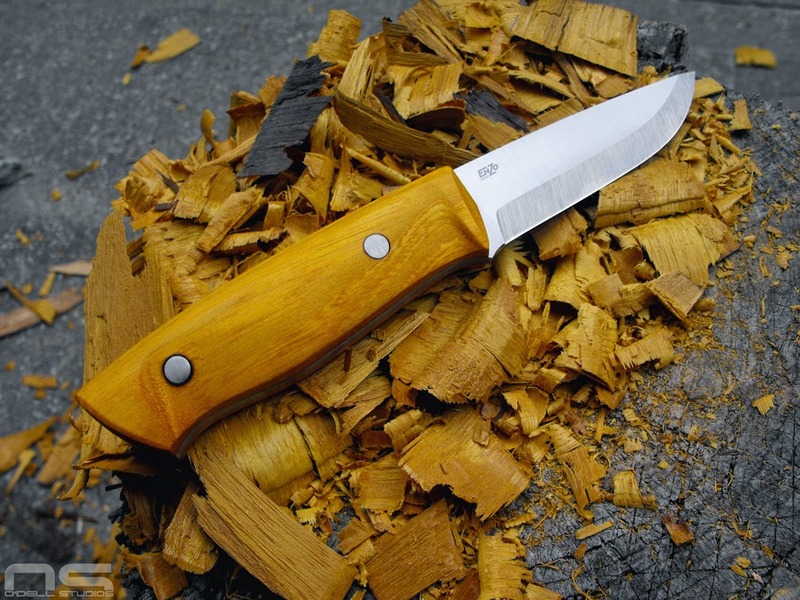 For my particular project, the Enzo Trapper fixed Scandinavian blade, I felt that a more traditional material was needed to make the package complete. 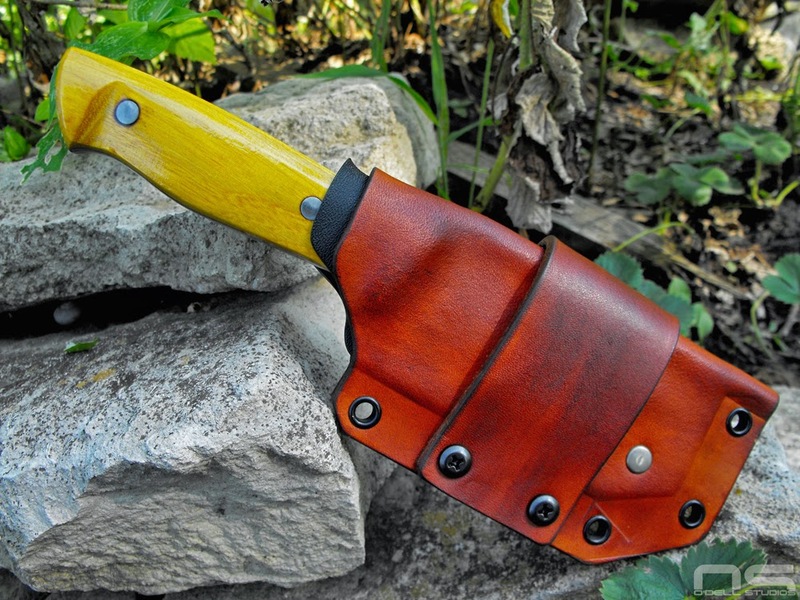 I used Hedge (Osage Orange) for the handle scales and I felt that leather would be the only way to go for the sheath. With that said, the benefits of Kydex are undeniable. It doesn't retain moisture and it provides retention that doesn't require any straps or snaps. By emulating Martin's designs, I could have modularity in case I wanted to add accessories or change from horizontal carry to vertical carry, and possibly bring those straps and snaps into play later if they became necessary for me. With my goals nailed down I went to work. I pressed the Kydex loosely on the theory that it would allow particles in the sheath to filter out around the blade. The deal with Kydex is that stuff gets into the sheath (or holster) so when you put the knife in, you get scratches. 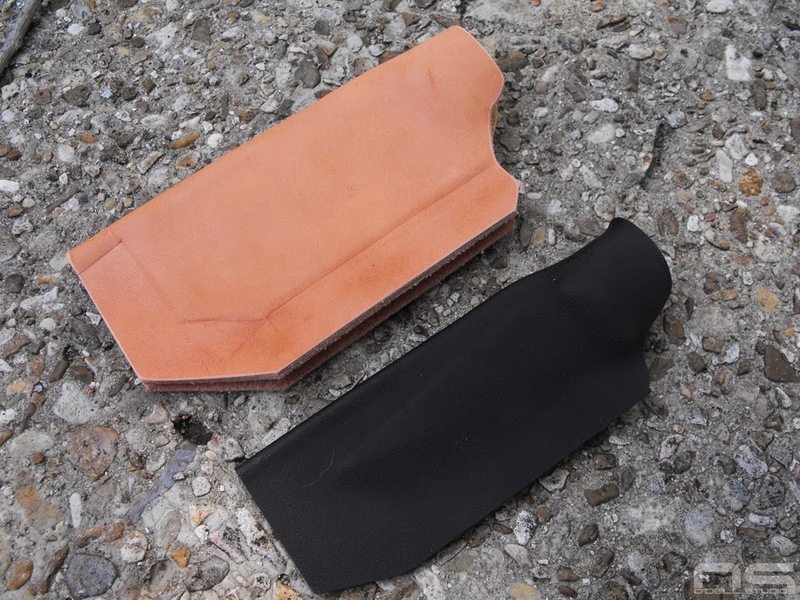 You will need to weigh the pros and cons for yourself when you design a sheath. For me, the benefits of Kydex outweigh this particular negative. I put three layers of tape on the blade and left about 1/8 inch of tape hanging over the cutting edge, trimming the tape in the same shape as the blade (effectively making the blade bigger so to speak). My theory was to create a gap at the edge so that it's not able to touch the Kydex at all. In the end, I can further theorize that creating a space inside the sheath may actually allow particles to fit and scratch the blade anyway. I can't say one way or the other with authority, but I can tell you that I have some very light scratches already. I honestly don't see how leather wouldn't have the same results and in fact leather is used for stropping presumably because of it's mildly abrasive nature. 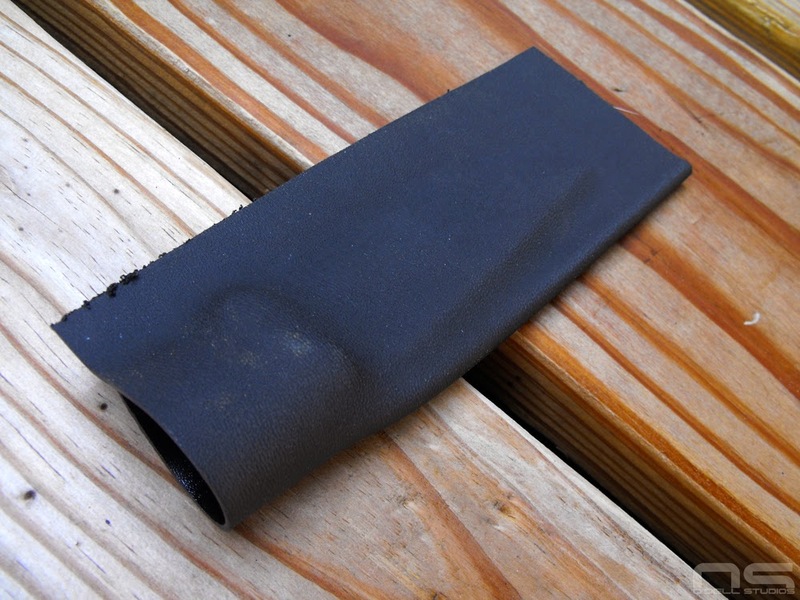 Debris is going to get trapped in a cavity like a sheath regardless of what material it is constructed of, and so in my mind, Kydex is the way to go for an insert. Leather work is also time consuming. It needs to be wet to form and then it really needs to be dry to finish and dry time, even if you heat it, can be long. There were some areas like around the throat of the sheath where I didn't really have a solid plan. I just went into free form mode and I would probably do it differently next time. My eyelets weren't really the correct size which took some fiddling, but overall I am happy with the result. It is meant to be worn horizontally on the front, but can easily be worn "scout" style on the back. I'm not absolutely sure of the benefits to scout carry. When worn on the front I can sit and bend naturally, I can see the knife at all times, and I can access it easily with both hands in any orientation. Having the big strap also provides a platform for other accessories and mounting variations. Lastly, I ended up using the Super Glue trick to finish the handle. Honestly, I prefer the appearance of the handle in the picture above where it is lying on a pile of wood chips. At that point it had a coat of boiled linseed oil and nothing else. However, I discovered a small crack after I had the handle nearly complete. I also knew that hunting season would mean blood for my knife so I decided that sealing up all the possible entry points for moisture was more important than looks. I painted on the Super Glue and used a buffing wheel to polish it. I can't foresee any moisture penetrating my handle now. All of my sheath parts ready for assembly. When polished the Super Glue is very glassy. I could have spent more time sanding it and adding more layers for a really heavy protective finish, but even at this point, you can see how shiny it is. All the pores like around the Corby Bolts, the hairline cracks, and the end grain, are sealed up for life. Remarkably the glossy finish also increased the grip. I am expecting the opposite when it's wet however. One additional comment I think should be made about Hedge for handle material. It is difficult or impossible to capture in pictures, though if you examine each image you might catch it, but it has an almost pearlescent effect in the light. The grain may not be the most exciting, but it really has some subtle interesting features. I am really pleased with the results. Thanks for reading!